CLEANFIX reversible fans are used in construction, municipal, agricultural, and forestry and recycling machines such as tractors, handlers, excavators, wheel loaders, tractors, harvesters, combines, sprayers, dozers, skid steers, and a variety of other industrial equipment. CLEANFIX equipped machines are valued for their maintenance free, automatic radiator cleaning and significant fuel savings. 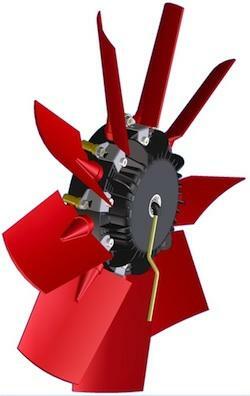 CLEANFIX variable pitch fan also contribute to optimal cooling and extended vehicle lives. The quality and performance of CLEANFIX reversing fans are confirmed by well know manufactures such as MERCEDES BENZ, BOMAG FAYAT GROUP, CATERPILLAR, KOMATSU, NEW HOLLAND, KRONE, CASE, MANITOU, CLAAS, HAGIE and OXBO. These manufactures incorporate CLEANFIX fans as standard factory installations or optional equipment. CLEANFIX fans may be mounted aftermarket using our installation kits custom designed for each application. Additionally, we are ready to help solve your specific cooling needs. If your machine's cooling system is a problem, no worries... We will CLEANFIX it! With its convincing advantages such as fuel savings of approximately 6%, the patented CLEANFIX system is the most effective reversing fan system in the world. It is revolutionizing the agricultural machinery and commercial vehicle industry. With the Standard Control (SC) reversible fan, the blades are reversed by compressed air using a pneumatic piston. The blades return to normal operation by spring force. If desired, the cleaning procedure can be automated using an electronic timer. 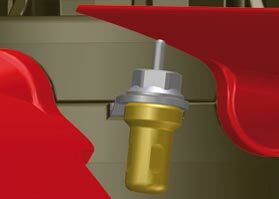 CLEANFIX fans require a compressed air supply to operate the reversing function. 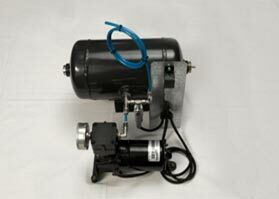 If needed, CLEANFIX will provide a heavy-duty compressor unit specifically designed for this application. CLEANFIX VP In addition to the reversing function of the CLEANFIX SC fan series for cooling and cleaning, this fan series offers variable blade pitch control. This change in blade angle corresponds to the cooling requirements of the machine. All this is achieved by the CLEANFIX fan itself, without intervention from the engine electronics. The CLEANFIX VP series offers the further benefits of a quieter vehicle operation, increased fuel savings, and reduced fan horse power consumption of up to 60%. During initial operation (when the engine is cool), the blade pitch is at its lowest angle resulting in an economical (ECO) cooling mode. As the temperature begins to rise, the thermal actuators expand to move the blades to a steeper position creating higher airflow performance. At high temperatures, the blade angle increases to its maximum pitch (POWER). Then as the engine and hydraulics cool, the thermal elements contract and the blades return to the most economical position. A pneumatic system (compressor) for the fan changing from cooling to cleaning of the radiator and coolers. Wax elements for the thermal blade angle adjustment according to the respective cooling needs. Elastomers in the thermal actuators regulate the blade pitch based on the speed of the fan. As the speed increase, blade pitch is reduced to ensure the most economical fan operation at any fan RPM. CLEANFIX uses thermal actuators for the adjustment of fan blade angles. These wax driven devices have proven reliability. 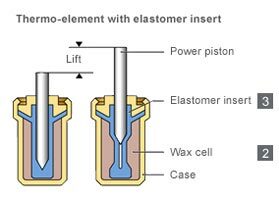 In a defined temperature range, the wax expands and moves a small piston, which adjusts the angle of the blades from a low to a steep angle. Since all the blades are connected to a common piston, the synchronization of their movement is ensured. This gives our system the highest possible level of reliability.